Modern macroeconomics is in a stalemate, with seven schools of thought attempting to explain the workings of a monetary economy and to derive policies that promote economic growth with price level stability. 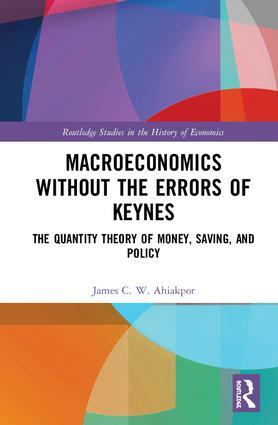 This book pinpoints as the source of this confusion errors made by Keynes in his reading of classical macroeconomics, in particular the classical quantity theory and the meaning of saving. It argues that if these misunderstandings are resolved, it will lead to economic policies consistent with promoting the employment and economic growth that Keynes was seeking. The book will be crucial reading for all scholars with an interest in the foundations of Keynes’ theories, and anyone seeking to understand current debates regarding macroeconomic policy-making.